Beef tripe, which is the lining of ​the beef stomach, is called callos in Spanish. It is a very traditional dish in Madrid and has been served in taverns and on family dining tables for centuries. It is a hearty meal perfect for cold winter days. Like all traditional dishes, there are many variations. This recipe includes Serrano ham and morcilla (Spanish blood sausage), while others might use ox cheek and a splash of white wine. It also has the option of adding garbanzo beans; although not traditional in this tripe dish, the beans thicken the broth a bit. Clean the tripe under cold running water. Set in a bowl of cold water mixed with the vinegar for 20 minutes, then rinse thoroughly. Cut into pieces approximately 3-inches square. Set aside. Coarsely chop 1 of the onions and remove and peel each clove from the head of garlic. Set aside. In a large heavy-bottomed pot, place the tripe pieces and split calf's/pig's foot. Cover with water and bring to a boil. Allow to boil for 1 minute. Drain into a colander and rinse the froth or scum from the meat. Return to the cooking pot. Add water to cover tripe and calf's/pig's foot. Put chopped onion and all but 3 peeled cloves of garlic, bay leaves, and peppercorns in​ the pot. Bring to a boil, then reduce heat. Simmer for 3 hours. Finely chop the remaining onion and 3 cloves of garlic. Cut the serrano ham into small squares. Slice the chorizo sausage into rounds. Heat the olive oil in a skillet and sauté onion, garlic, ham, and chorizo for 5 minutes, or until onions are translucent. Remove from heat and stir in the paprika. Add the mixture to the pot with the tripe. Cut the morcilla into rounds and place in the pot. If using the optional garbanzo beans, add them now and simmer for 15 to 20 minutes. 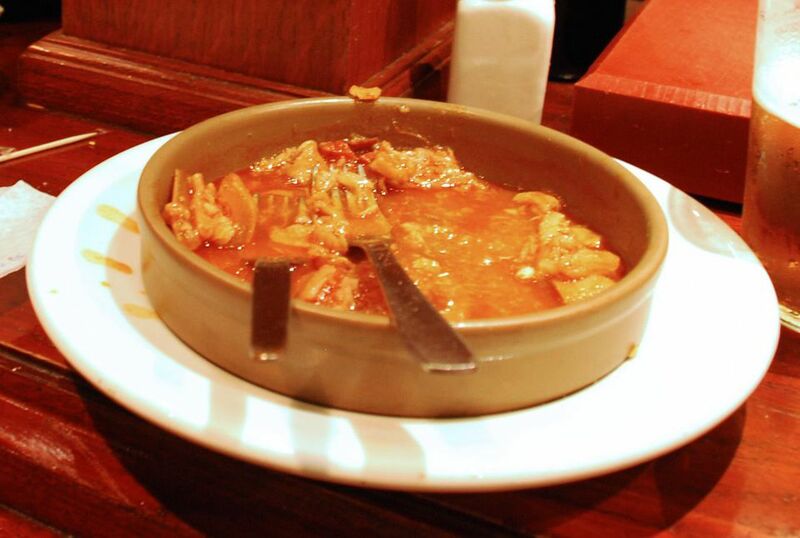 The traditional way to serve callos is in earthenware bowls accompanied by rustic bread. Enjoy!